Lodge Brothers had the honour of sponsoring Whiteley Village for another one of their great events this year. This time it was the Whiteley Races Day, which were held on Sunday 10th June, with over 500 participants of all ages. Numerous races were run, culminating in the main event, the 10k. 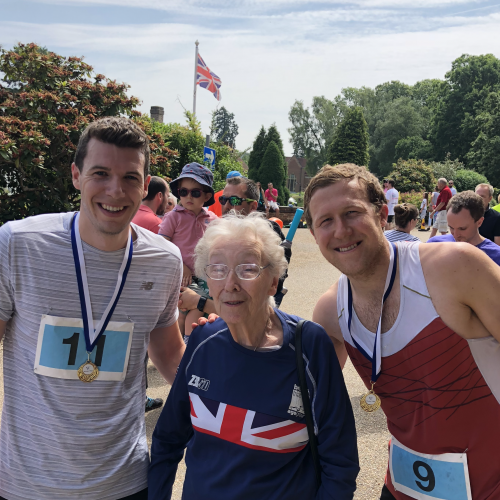 The men’s race was won by Adam Bennett (pictured on the right) with the outrageous time of 39min09sec, a full 1min29sec in front of second! Adam’s brother Oliver (pictured left) finished a very respectable 10th place with a time 48min36sec. Both Adam and Oliver are good friends of Lodge Brothers own Xenos Foster, who was proud to present them with their Whitely Village branded medals! The Bennett’s grandmother and Whiteley Village resident, Elizabeth Whiteing (pictured centre), was one proud lady! !